I don’t know about you, but lately I’ve been having difficulty concentrating on as well as remembering things. Multi-tasking used to be effortless, but now it’s a daily struggle. Do you go into a room and totally forget why you’re there? Do you have sticky notes all over your home or office? I can’t even tell you how many times I’ve misplaced my glasses. Is this part of aging, or should I be worried? I just hope it’s not an early sign of Alzheimer’s disease. I’ve read that most age-related losses in memory or motor skills are simply a result of inactivity and a lack of mental exercise and stimulation. Hopefully, I fall into this category. For those of you having similar issues ~ here are a few recommended exercises to recharge your brain. 2. Challenge your brain to learn new and novel tasks such as yoga, dancing, chess….especially the things you’ve never done before. 3. Travel is another way to stimulate your brain. I like this one! 4. Read, read, read! Play scrabble, crossword puzzles, bingo. Learn a new language and watch less TV. 5. Exercise! Walking is especially good for your brain, because it increases blood circulation and oxygen to your brain. Maybe this is why walking can clear your head and help you think better. Now, let’s see how I can incorporate these exercises into my daily routine so I can remember where I placed my favorite black linen pants! Thank you so much for reading and until next time…take care! My dear you seem to look younger each time i see you! You look absolutely F.A.B.U.L.O.U.S. !!!! Oh, I wish! Thank you Tamera! this is such a great dress! love the t-back on it! i like how you paired it with that lovely jacket too!!! I actually wore this dress on the plane from Hawaii. It’s so comfortable! Thanks! As I get older, I find myself drawn to comfortable clothes, and this one is definitely that! oh my goodness, my brain is so bad right now! i can’t remember anything! i love that striped maxi. it’s so summery and classic! Thanks for your lovely comment, Your hair is fantastic !!! You look so tanned and toned in that dress! Thank you, and happy weekend to you as well! Fabulous look! And thanks for the tips – I have a poor memory so I’ll add these to my reportoire of coping mechanisms! Thanks! You’re too young to be having memory issues, but I guess it’s never too late to start taking care of your brain. A very pretty dress. It makes a splendid figure. It seems very comfortable. Your hair is very pretty with this hairstyle. love the ‘racer back’ of the dress! and yes, #3 is my favorite brain-saver, too! i need to do some travel – soon! I was happy to see the “travel” on the list, too! When I get tired of working, I think of my next trip to get me thru the day….if only I had a money tree. Well, I was always pretty forgetful, so the bar is set pretty low. I definitely have more trouble focusing these days. I just assumed that the constant interruptions of my job did it to me — or that I caught adult-onset ADD from my students! NICE dress, by the way! Haha, ADD?! My worries started when I would forget a simple word in mid sentence…. Love the maxi! Taking one along for our weekend trip. You always look great! Thank God I’m not the only one forgetting stuff!!!! Really need to use my brain more. I’m also glad I’m not the only one! Have a wonderful trip!! I know what you mean about “losing my mind”–I ‘ve out in down to having Menopause Mind!!! My son-in-law even thought your picture was our daughter!! You really DO look like a 26 year old!! 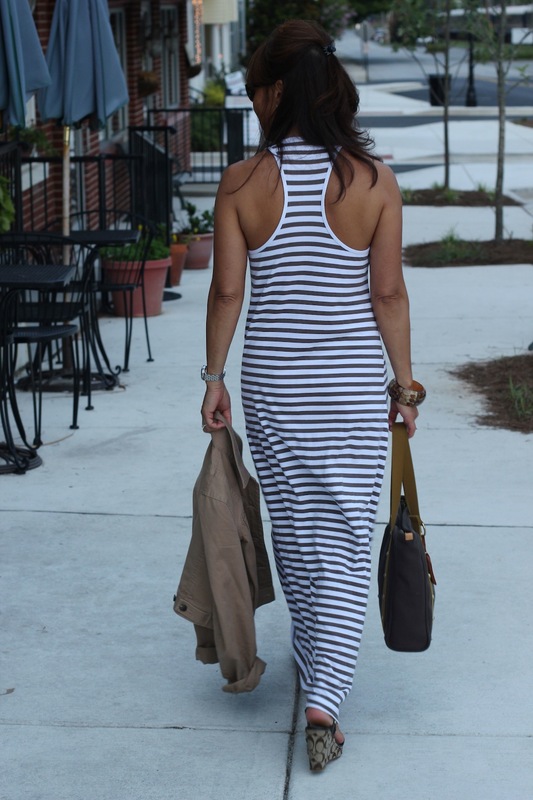 love the racer back maxi!! my doctor friend said that as long as you remember that you forgot everything is okay!! Haha! That’s a good one! Oh, I remember how much I can’t remember!! No doubt! I have stickies (widgets) all over my computer. I even have them as notes in my Mail. I need them to keep track otherwise I forget what I need to do! I’m glad to hear I’m not alone in this. I also send emails to myself to remember things…gosh, I feel better! First, I love how this dress looks on you! Second, yes, I have noticed a change in the way I think. It’s not so much a memory thing as a lack of organization! I have many notes to self…and related clutter. You’re in a profession that requires you to read, so I’m sure your brain is getting plenty of stimulation. I just have so much going on at work…. just can’t seem to get it together. Maybe it’s the stress?! Are you kidding me??? I already feel like I’m taking a drive down dementia highway….I can’t remember ANYTHING these days. I will try your tips and see if they do any good, maybe I won’t have that constant look of confusion on my face anymore!! I just told hubby, he says thank you! Cute dress, but I really LOVE the shoes! Yes I am having some issues like this too. The worst is when I’m in a meeting and I just lose the word that I am about to say! I am usually very articulate so it has been SO frustrating. I’d like to know more about Sara’s Musing’s bad year. I think I’ve been in that stage for about 18 months now and still going strong. Ugh. Oh! I’ve been forgetting words, too!! I mean easy words! It freaks me out when that happens. I been very fortunate not to have had the usual symptoms, and I’m pretty sure I’m done with that stage….I think. Lovely stripes; I can’t get enough of them. I got a stripey dress that I love this year too. AND, whenever I forget things and pass the turn to the drycleaner twice etc., I think of my teenagers and realize how much better our memories and organization are than theirs, and I realize that I am fine. I am just trying to keep track of the business of five people instead of one! I’ve missed a turn one too many times myself! Glad to hear you do it, too! Oh! Great to-do list for us 🙂 I have a Father that is entering the later stages of dementia and a grandmother that passed away after suffering from Alzheimer’s disease. Very sad and I am doing everything I can to keep my mind and body young. Blogging included!! P.S. Is that little puppy yours? Did you get a baby? Haha, I hope blogging counts!! I am totally addicted to maxis this summer. I LOVE this TB racer back and of course… always the bag. I still do not have one but it’s on my list of … I need, I want, I must have some day. Me, too!! So easy and comfortable! Have you gone through the “throes” of menopause? Your symptoms sounds more like that at your age. I had one horrid year of going through menopause (Oct. 2001 to the end of 2002) but once it was over I felt like a whole new woman. By the way, that’s a very nice outfit (striped maxi) and shoes although I stopped wearing “wedges” after stumbling on a rock and really twisting my ankle. I wish I could wear clothes as well as you do (maybe I’ll get close once I get the last 50 lbs off–already down 45 but have stayed the same now for several months and it’s time to get back on the wagon again!!! I do exercise for almost one hour a day five to seven days a weeks and have now for several months. I feel GREAT, too (for being 60!!!). 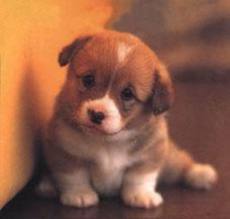 Oh, yes… I l love the pic of the adorable little puppy!!! You’ve lost 45lbs? Wow! That’s fantastic! Keep it up!! I’m behind you!